Book: Big & Little by Steve Jenkins. This nonfiction title was a great introduction to the concept of big and little, showcasing related animals that differ in size (example: house cat and tiger, python and coral snake). I paper-clipped some of the pages together, so we didn't look at every spread, but the kids enjoyed helping me identify animals and which were bigger and which were smaller. Song: The More We Read Together. We've been using this special library verse in baby storytime for awhile now, and I thought it'd be a nice addition to this storytime since it talks about big books and small books. Thanks to Jbrary for teaching me this song!! Book: I'm the Biggest Thing in the Ocean by Kevin Sherry. I love this book for the bright, large pictures and humor. Parents and kids were definitely laughing along with me when we reached the twist in the story. Kids also had fun helping me identify ocean animals. All these animal books are great for introducing and reinforcing vocabulary! Book/Song: The Itsy Bitsy Spider by Richard Egielski. Since we read a book about something big, I wanted to share a book about something small. This pop-up book is a fun one to share and the kids sang along and did the motion as I turned the pages in the book. Singing songs is a great way to help children hear that words are made up of smaller sounds and doing hand and arm motions help increase fine and gross motor skills. Action Rhyme: This is Big, Big, Big. This one comes to me from Melissa Depper at Mel's Desk and just fit right in with our theme today! This was a good point to get everybody standing and do a little action rhyme. Book: Big, Bigger, Biggest by Nancy Coffelt. Vocabulary, vocabulary, vocabulary! This book shows a variety of animals compared to each other - big, bigger, biggest; fast, faster, fastest; etc. It also includes a TON of synonyms for each word - large, humongous, etc. which makes this a great book for exposing kids to lots of new words. 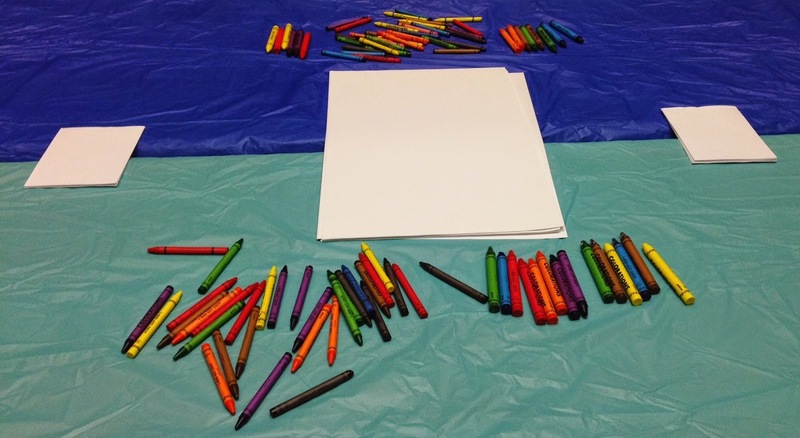 I set up tables where kids could make big pictures (11"x 17" paper) or little pictures (quarter sheets) with big crayons or small crayons. I set up our magnifying equipment for kids to explore. We have the Can Do Magnification Discovery Kit from Lakeshore Learning and I put out additional magnifying glasses and some random bits from our craft supplies for kids to look at. I set out our wooden blocks, which are always a big hit. And, of course, I had a book display! All in all, it went pretty well. I only had a couple that stuck around for our stations, but the ones that did stayed for about 20 minutes and had a great time building and exploring. 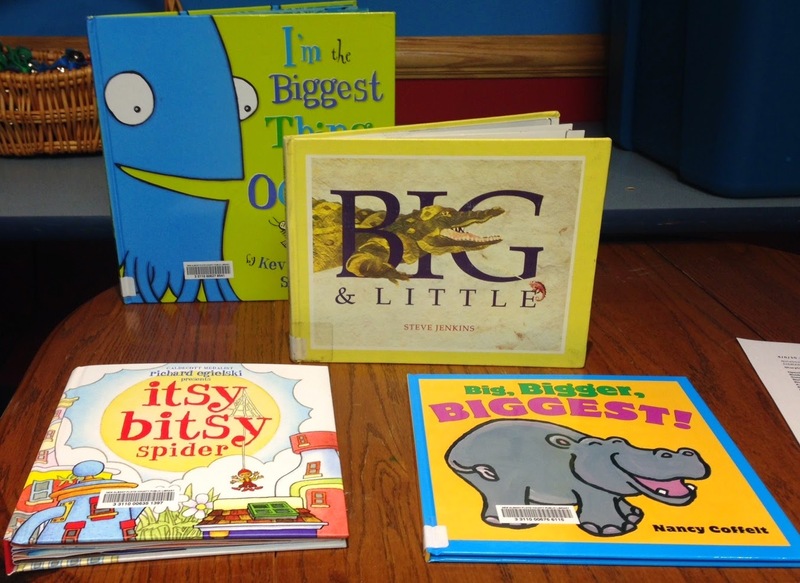 What are YOUR favorites for Big & Little? ?